Looking for a way to have fun playing your favorite sports? Check out the Dallas Sport & Social Club! 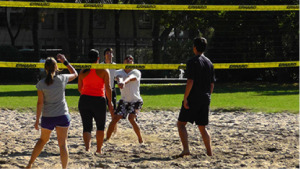 You can participate in softball, sand volleyball, and kickball, to name a few of the options they offer. Recreational sports can be part of a healthy lifestyle, but keep in mind that the risk of being injured accompanies any physical activity. When that happens, it’s important to take the right steps for a complete injury recovery. Protection. Resting your injured area is the start to your recovery process. Your body plays an integral role in healing itself, but it needs time to do so. If you are continuing to push your body at this time, you risk causing further damage. Movement. After spending a day or two of rest, you should gradually begin measures to resume a full range of motion. This is achieved with gentle stretching (which also helps prevent scar tissue) and simple movements. When we look at an ankle sprain, this can be as basic as slowly rotating your foot. Strength. After the swelling has subsided and you have restored range of motion in the affected joint, you should start to rebuild your strength. It is essential that you begin doing so at a low level of intensity and gradually progress from there. A good rule of thumb is a 10% increase per week. Alternate activities. In order to promote a thorough, effective healing process, incorporate exercises and activities that do not strain the affected area. Slowly build up your endurance and levels of frequency and duration over time. When you sustain an ankle or foot injury, your road to successful recovery starts by enlisting the help of our foot and ankle experts at Dallas Podiatry Works. Our caring professionals not only ensure that you receive effective treatment to address the injury now, but we will also set you up to prevent future complications. Schedule an appointment at either our Dallas or Plano, TX offices by calling toll-free 972.566.7474, or use our online form to get the help you need today!